Welcome to the first stop aboard Magical Blogorail Blue. 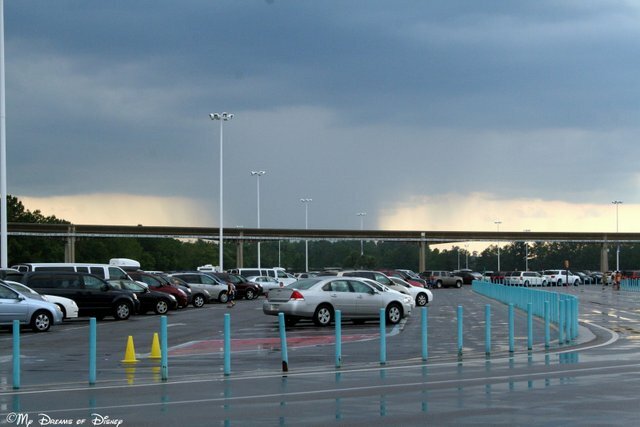 Enjoy the ride as we share Tips for Rainy Disney Days. When it rains, here are five attractions at the Magic Kingdom to enjoy! 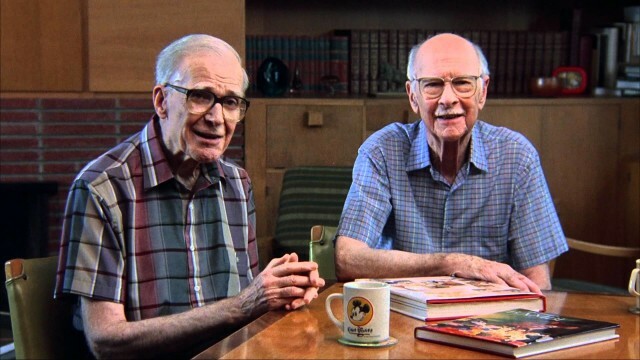 Hello everyone, and thank you for joining us today! In this edition of the Magical Blogorail, we are taking a look at some tips for enjoying Disney even when it is raining. Just because it’s raining doesn’t mean that the fun has to end! In fact, it is often during periods of rain that the parks clear out, leaving a lot of great attractions just waiting to be enjoyed with much smaller lines! But for this post, I’m taking a look at five Magic Kingdom attractions that are good for enjoying during a shower because they are long enough that you often can enjoy the ride/show/attraction, and when it is over, the rain has passed! 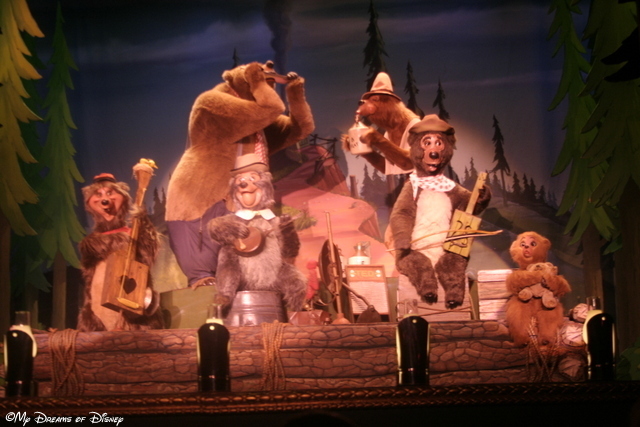 Country Bear Jamboree is a great show, rain or shine! This show is a favorite of mine — and is a Walt Disney World/Magic Kingdom original from October 1, 1971! It’s kind of homey, kind of country, but it’s a lot of fun for this writer! The show is 15 minutes, 55 seconds long, and has a generous lobby to wait in, so if it’s raining, it’s a great place to avoid the storm! 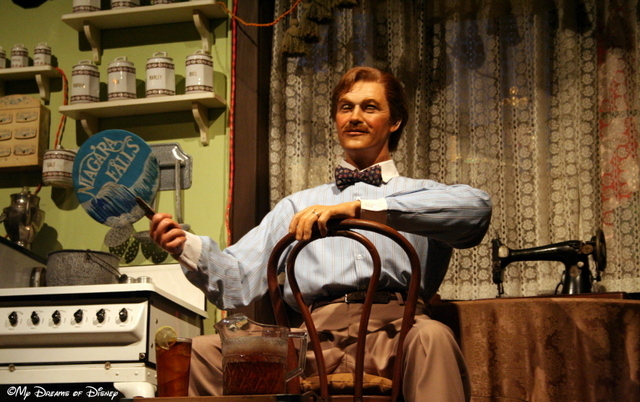 The Carousel of Progress is located in Tomorrowland, and is a great show to enjoy at any time! Another great attraction during the rain is the Carousel of Progress. This show is an all time favorite of mine, but what makes this attraction great for rainy days is that the overhang is great for staying out of the rain, and the show is long enough to see you through a lot of Florida showers! 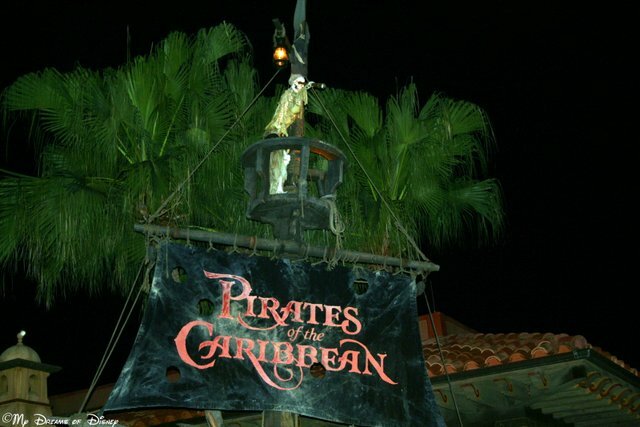 Pirates of the Caribbean has many unique features to beat the rain! When it comes to queue lines at the Magic Kingdom, you’ll be hard pressed to find an attraction with as great of a queue as Pirates of the Caribbean, especially for rainy days. If it’s raining, and you want to get out of the rain, head into Pirates and you’ll be able to meander through hundreds of feet of covered areas to reach the attraction, and then, the attraction itself is long enough that you might just forget that it’s raining! 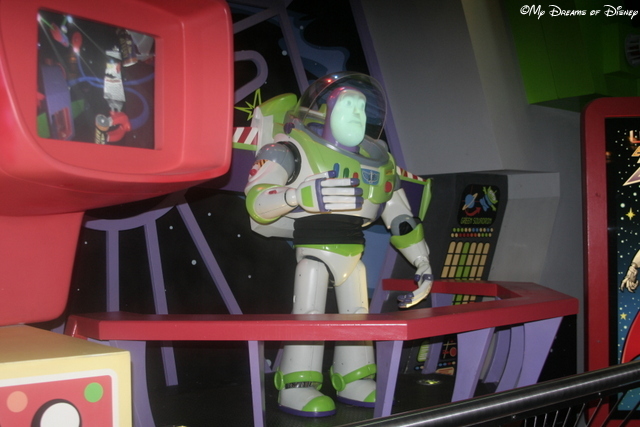 Lastly, if you have gotten wet in the rain, if you happen to get splashed on the ride, it won’t be nearly as annoying! Sounds like a win-win-win to me! Mickey’s PhilharMagic is a great show to see when it rains! 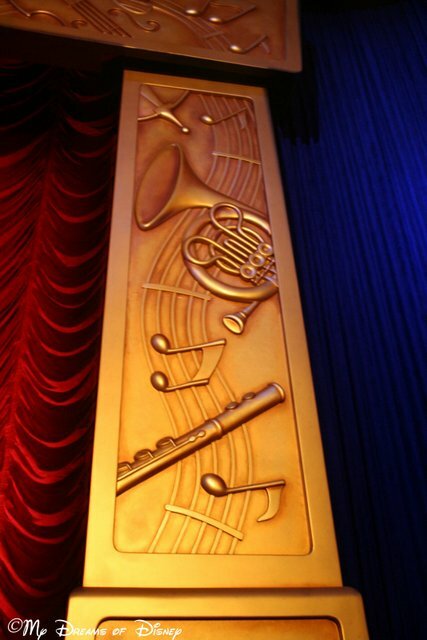 If you want a great show, incredible scenes from some of your favorite Disney movies, and great music that lasts for a while, then have a look at Mickey’s PhilharMagic. This show is great to beat the rain with, and when the show is over, if it’s still raining, go wander through the gift shop for a while and get some souvenirs taken care of! 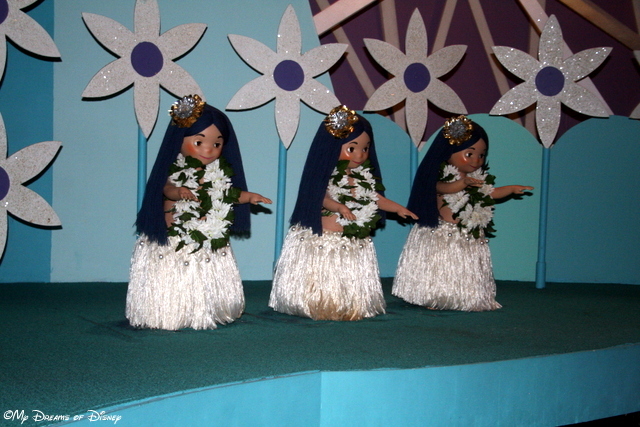 it’s a small world is a slow enough ride that you can use it to beat the rain! I know what you’re going to say — don’t ride it’s a small world because of the song! You don’t want that stuck in your head all day, rain or no rain! Of course, I love the song, so I don’t mind getting it stuck in my head, but it’s a great way to escape the rain, with it’s long covered queue line and long, slow moving boat ride! You know, sometimes the rain doesn’t go away very quickly, and you have to endure the ponchos and umbrellas and all of that mess. However, when the rain does stay for a while, it can often lead to a lot of people deciding to leave the park for the day. When that happens, like it did for us back in 2010, it leads to photos like this one, during a very low capacity extra magic hours. 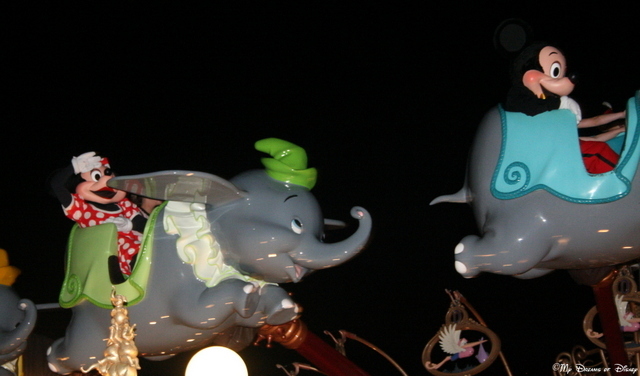 Mickey and Minnie were riding Dumbo after midnight that night!